Fingernails and toenails with red nail polish. In Egypt, the lower classes wore pale colors, whereas high society painted their nails a reddish brown color, with henna. Mummified pharaohs also had their nails painted with henna. Colored nail polish did not make an appearance until the 1920s. Early nail polish formulas were created using basic ingredients such as lavender oil, Carmine, oxide tin, and bergamot oil. It was more common to polish nails with tinted powders and creams, and finishing off by buffing the nail until left shiny. One type of polishing product sold around this time was Graf's Hyglo nail polish paste. This type of nail polish is a clear, milky-colored, or opaque pink polish formula that is used specifically before applying nail polish to the nail. The purpose of it is to strengthen nails, restore moisture to the nail, and/or help polish adhere to the nail so staining will not occur and the manicure lasts longer than without a base coat. Some base coats are marketed as "ridge fillers" which can create a smooth surface, and reduce the appearance of the ridges that can appear on unbuffed nails. Some base coats called "peel off base coats" allow the user to peel off their nail polish without using a remover. Gel polish is a long-lasting variety of nail polish made up of a type of methacrylate polymer. It is painted on the nail similar to traditional nail polish, but does not dry. Instead it is cured under an ultraviolet lamp or ultraviolet LED. While regular nail polish formulas typically last two to seven days without chipping, gel polish can last as long as two weeks with proper application and home care. Gel polish can be more difficult to remove than regular nail polish. It is usually removed by soaking the nails in pure acetone (the solvent used in most nail polish removers) for five to fifteen minutes, depending on the formula. Traditionally, nail polish started in clear, white, red, pink, purple, and black. Nail polish can be found in a diverse variety of colors and shades. Beyond solid colors, nail polish has also developed an array of other designs, such as crackled, glitter, flake, speckled, iridescent, and holographic. Rhinestones or other decorative art are also often applied to nail polish. Some polish is advertised to induce nail growth, make nails stronger, prevent nails from breaking, cracking/ splitting, and to even stop nail biting. French manicures are designed to resemble natural nails, and are characterized by natural pink base nails with white tips. French manicures were one of the first popular and well known color schemes. French manicures may have originated in the eighteenth-century in Paris but were most popular in the 1920s and 1930s. However the traditional French manicures were much different from what we know today. They were generally red, while leaving a round crescent shape at the top blank to enhance the lunula of the nail, known now as a half moon manicure. With the modern French manicure, trends involving painting different colors for the tips of the nails instead of the white. French tip nails can be made with stickers and stencils. It is still typically done by hand through painting with polish or gel, or sculptured with acrylic. Social media has given rise to the nail art culture that allows users to share their pictures about their nail art. 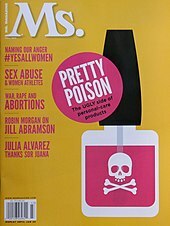 "WWD reports nail polish sales hit a record $768 million in the U.S. in 2012, a 32% gain over 2011, despite a cluttered market that seemingly sees a new launch each week." Several new polishes and related products came on to the market in the second decade of the twenty-first century as part of the explosion of nail art, such as nail stickers (either made of nail polish or plastic), stencils, magnetic nail polish, nail pens, glitter and sequin topcoats, nail caviar (micro beads), nail polish marketed for men, scented nail polish, and color changing nail polish (some which change hue when exposed to sunshine, and ranges which change hue in response to heat). [year needed] Pinterest, Instagram, and YouTube have been popular social media sites on which many people around the world are posting their unique nail art. Nail polish in the Western world was more frequntly worn by women, going in and out of acceptability depending upon moral customs of the day. In Victorian era culture it was generally considered improper for women to adorn themselves with either makeup or nail coloring, since natural appearances were considered more chaste and pure. In the 1920s, however, women left corsets and long gowns behind, changed to simple loose-fitting dresses, and began to wear color in new makeups and nail products, partly in rebellion to such prim customs of their recent past. Since the 1920s, nail colors progressed from French manicures and standard reds to various palettes of color choices, usually coordinated with the fashion industry's clothing colors for the season. By the 1940's the whole nail was painted; before that, it was fashionable to have the tips bare and paint a half-moon on the nail bed. It is less common for men to wear nail polish, and the usage can be seen as violating traditional gender norms. Uses include clear polish to protect nails from breakage, and colored polish on fingernails and toenails. Nail polish remover is an organic solvent that may also include oils, scents, and coloring. Nail polish remover packages may include individual felt pads soaked in remover, a bottle of liquid remover used with a cotton ball or cotton pad, or a container filled with foam into which one inserts a finger and twists it until the polish comes off. Choosing a type of remover is determined by the user's preference, and often the price or quality of the remover. The most common remover is acetone. Repeated use can cause the skin around the nails to become dry or cracked. Acetone can also remove artificial nails made of acrylic or cured gel. An alternative nail polish remover is ethyl acetate, which often also contains isopropyl alcohol. 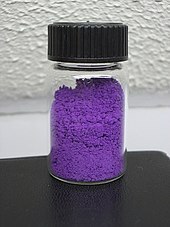 Ethyl acetate is usually the original solvent for nail polish itself. Nail polish is considered a hazardous waste by some regulatory bodies such as the Los Angeles Department of Public Works. Many countries have strict restrictions on sending nail polish by mail. The "toxic trio" are currently being phased out, but there are still components of nail polish that could cause environmental concern. Leaking out of the bottle into the soil could cause contamination in ground water. Chromium(III) oxide green and Prussian blue are common in nail polish and have shown evidence of going through chemical degradation, which could have a detrimental effect on health. ^ a b c d e Toedt, John; Koza, Darrell; Cleef-Toedt, Kathleen van (2005). Chemical Composition Of Everyday Products. Greenwood Publishing Group. p. 49. ISBN 978-0-313-32579-3. ^ a b Sherrow, Victoria (2001). For appearance' sake: The historical encyclopedia of good looks, beauty, and grooming. Phoenix: Oryx Press. p. 119. ISBN 978-1-57356-204-1. ^ a b c "On How to Be Lovely". Edwardian Promenade. 2010-04-15. Retrieved 2018-05-06. ^ a b "The One Step You Should NEVER Skip in Your Mani". Good Housekeeping. 2015-09-21. Retrieved 2018-05-06. ^ Sun, Feifei (2013-01-28). "Nail Polish Sales Hit Record $768 Million in U.S." Time. Retrieved 2013-12-06. ^ Edwards, Nelta M. (October 2010). "Using Nail Polish to Teach about Gender and Homophobia". Teaching Sociology. 38 (4): 362–372. ^ Emma Carlson Berne Nail Care Tips & Tricks 2015 - Page 13 1467786551 "Chrome. Many polishes give off a metallic sheen. Duochrome or multichrome polish contains several colors. The colors flash differently, depending on the reflection of the light. Iridescent polish is a softer version of duochrome." ^ "Safety Data Sheet: Acetone" (PDF). JM Loveridge. Archived from the original (PDF) on 2013-11-01. Retrieved 2013-12-06. ^ Twenty-Fifth Commission Directive 2000/11/EC of 10 March 2000 adapting to technical progress Annex II to Council Directive 76/768/EEC on the approximation of laws of the Member States relating to cosmetic products. OJEC L65 of 14 March 2000, pp. 22–25. ^ a b Reutman, Susan (3 March 2009). "Nail Salon Table Evaluation". National Institute for Occupational Safety and Health (NIOSH) Science Blog. Centers for Disease Control and Prevention. Retrieved 3 April 2014. ^ Marlow, David A.; Looney, Timothy; Reutman, Susan (September 2012). "An Evaluation of Local Exhaust Ventilation Systems for Controlling Hazardous Exposures in Nail Salons (EPHB Report No. 005-164)" (PDF). Department of Health and Human Services, Centers for Disease Control and Prevention, National Institute for Occupational Safety and Health. Retrieved 5 March 2013. ^ "Dangers of Nail Polish – Toxic Chemicals in your nail polish". TorquayHeraldExpress.co.uk. Local World, Ltd. 1 April 2014. Archived from the original on 5 April 2014. Retrieved 2 April 2014. With inviting names such as peaches and cream or Caramel Smoothie, you are led away from the potential dangers of these polishes, with some ingredients that are known cancer causing chemicals and those toxic to the nervous system. The top three chemicals of concern are toluene, dibutyl phthalate (dbp) and formaldehyde – the so called 'toxic trio'. ^ Phthalate chemicals in nail polish, hair sprays tied to raised diabetes risk in women. CBS News (2012-07-16). Retrieved on 2015-11-22. ^ "STOP: Why You Shouldn't Throw Old Nail Polish In The Trash". 2016-07-31. Retrieved 2018-05-06.